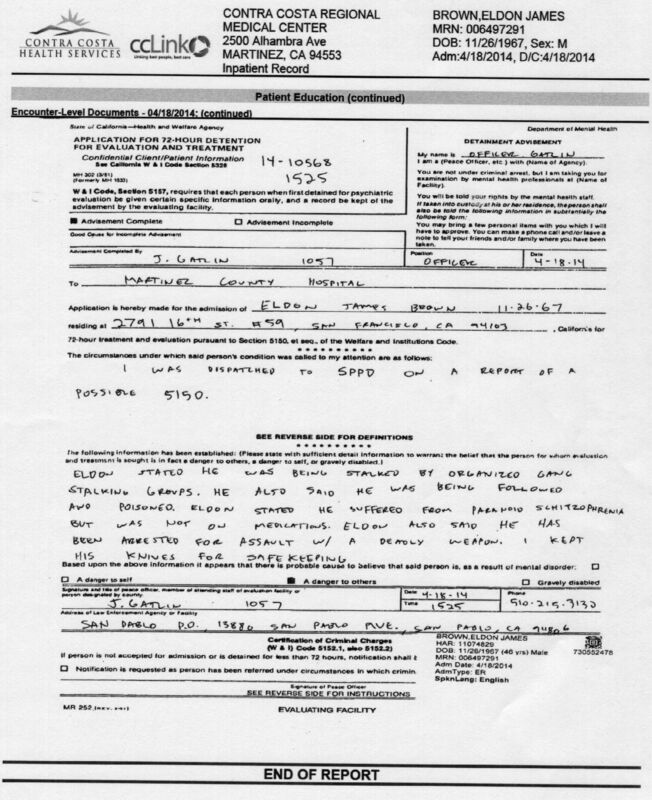 On April 18th, 2014 I attempted to file a complaint with the San Pablo Police for being Gangstalked in their city. When the Officer showed up, instead of taking my complaint he decided to violate my civil rights by subjecting me to an unjust and unnecessary civil commitment (5150 WIC). I was released in less than three hours because I obviously did not meet the requirements of being gravely disabled, neither a threat to myself nor the public, when evaluated by psychiatrists. This Officer smirked as he questioned me about my mental health history, as if he had just won the lottery. I suppose if your police department actively engages in Gang Stalking, then having a victim of Gang Stalking thrown into the looney bin and hopefully discredited is a huge victory of sorts for you. Well, I guess a tiny Podunk police agency infected with traitors probably wouldn’t be aware that most of the nation (and the world at large) is catching onto the treasonous crime of Gang Stalking. They probably think they still have the trust and good will of the people too. I suppose that is why they didn’t hesitate to do something so blatently obvious by trashing my Constitutional Rights in an attempt to hide their Gang Stalking complicity. They should think again. More and more people know what Gang Stalking, Organized Stalking, Mobbing and COINTELPRO are all about. A critical mass of people on their way down to the gutter are waking up to the fact, that they are nothing more than slaves and have a big, government boot on their necks. Edward Snowden wasn’t the first to alert us of the tyranny, but thank God he was the loudest. People are beginning to understand that we are not free and that we desperately need to do something about it. My complaint about Gang Stalking coupled with the subsequent complaint of my Civil Rights being trampled upon is just the start of what I hope to be a very loud and noisy contest. We have to do more than wake up people, we need to act. Not in the future nor even now but RIGHT NOW, this very instant. And here it is, the expected rejection letter. I was told by attorney’s that this was prerequisite before filing a lawsuit. Now, I need to find a Constitutional lawyer/s with a cause. It should’nt be so easy to lose all legal standing as a human being just because you availed yourself of any mental health treatment in the past. Anyone who has ever been counseled, had therapy or received any treatment from a mental health worker in the past can have all of their civil liberties maliciously stripped from them just as I did. The set of California codes that make this possible is terribly abused by both private individuals (spouses), and “professionals” as well (Health Care Workers, Landlords, Cops, Gang Stalkers). I feel it my duty not only as a patriot but also as a good American to see this violation rectified. The Lanterman Petris Short Act (LPS Act) must be wholly rescinded in California, since it is employed as a weapon of oppression favored by both state actors and petty tyrants alike. As we have seen from past history, as California does, so goes the rest of the country. You really don’t want to be this vulnerable to the caprices of anyone with an accusation , do you? Any legitimate attorneys out there who would be interested in a case like this, please contact me. 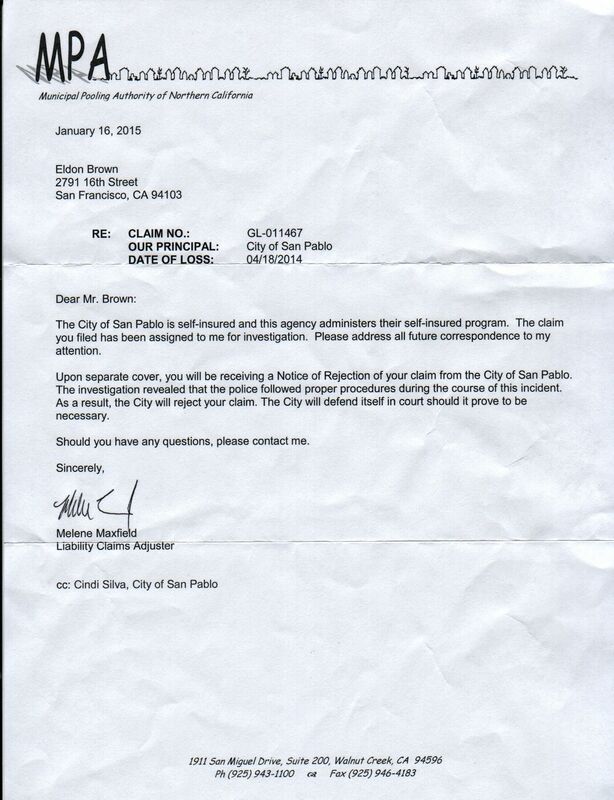 Rejection letter for my claim against the City of San Pablo for violating my Civil Liberties, dated January 16th, 2015. 99 days after submission of my claim. And here we have the icing on the cake, the police absolving themselves. How many times have we seen this before? Well, at least I can say one thing, any defense attorney will tell you to never admit that you were in the wrong. In the wrong however, is exactly what Richmond Police Dispatch in collusion with the San Pablo Police Department were. As you will see from the committing officer’s (San Pablo Police Officer Justin Gatlin) 5150 application, Richmond Dispatch told him I was a possible nut job. What a joke considering that the Richmond Police supposedly have a policy specifically to prevent Gang Stalking, authored by supposed Targeted Individual Renata Murry and others. Ha, SHE IS A GANGSTALKER! So Richmond PD now has this bogus policy that is supposed to prevent Gang Stalking, but then their dispatcher labels you as a nut job if you complain about being Gang Stalked and sends an officer to involuntarily commit you. 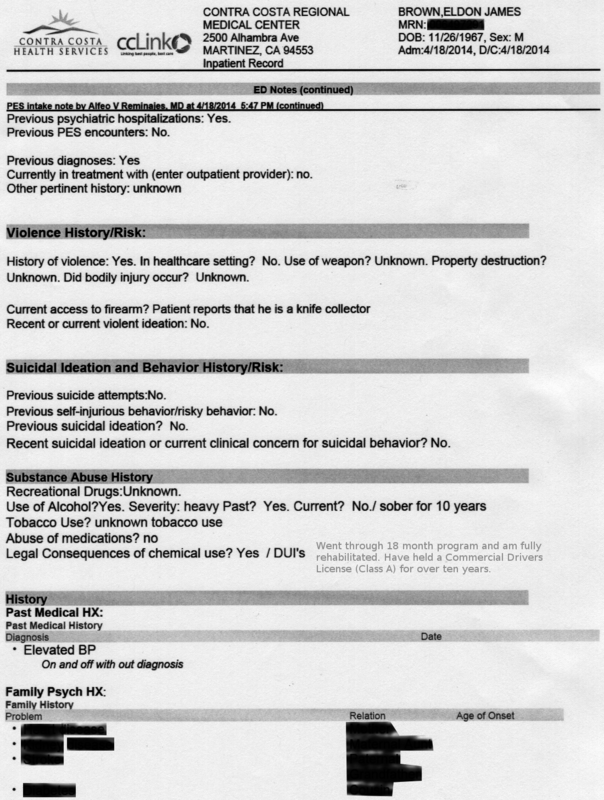 See the box at the bottom blacked out that says I’m a possible “danger to others”? If that were the case, why haven’t I been arrested in over ten years? Why have I not been arrested almost a year since this fiasco? Why have I not hurt anyone in any way in twenty five years? I haven’t been dangerous in over two decades! A danger to others?? The picture below is exactly how I looked on the day San Pablo Police Officer Justin Gatlin thought (in his personal opinion) that I was a possible danger to others. Does the man pictured below look like a dangerous lunatic to you? People that were arriving at the San Pablo Police station actually thought that I was a Cop! The EMT’s that arrived in the ambulance (totally ridiculous) actually had anxiety attacks when I started to get into the back of the ambulance since I looked just like one of them! They were both Iraq War Veterans and the sight of watching me getting into the back of the ambulance actually caused them to have flashbacks, like I was a fellow fallen warrior or something. I actually felt bad for them. A danger to others? Yeah, good call Officer Gatlin. Thanks a lot Richmond PD Dispatch, your anti-harassment policy is crap. Exactly how I looked on the day the officer had me involuntarily committed for attempting to file a complaint about being gangstalked in the city of San Pablo. Pics taken the day after. Oh, and by the way, my “assault” was actually self-defense. It was 1985, I was 18, homeless and very drunk when I walked into an AT&T building in downtown Oakland to use the bathroom. It was very late and the security guard was very rude. He began to approach me in a hostile manner and I pulled out my knife to keep him away. He advanced on me anyway and I couldn’t get the door open to escape. I was trapped as far as I knew. The security guard continued to advance until he was upon me, he then grabbed the wrist of the hand holding the knife! Who does that? As I reflexively pulled my arm away, the knife cut him on the palm. He then retreated from me. Now angry for what I had just been put through, I broke a window on the way out with my elbow. The whole thing was so unnecessary, I just wanted to use the bathroom. I was tired of being abused just because I was a homeless teen. If my story sounds dubious, just think about it. How do you cut someone on the palm of their hand? Possibly a defensive wound but that would more likely result in the forearm being injured. If you grab someone’s wrist who is fending you off with a knife and they pull their arm back, the knife will almost surely catch your hand. My mom didn’t know anything about the criminal laws and all my Public Defender wanted to do was plead me out since the security guard had witnesses and I did not. There was probably a camera but I never heard of any film. All I had wanted to do was to use the bathroom, I was homeless and needed to pee. What kind of a dufus advances on a guy holding a knife trying to get out the door anyway? When does it make sense to try to disarm him, why not just let him leave? A Wanna-be maybe? Anyway, that is my one “assault”, twenty five years ago, which was really self-defense if I could have afforded a decent lawyer, not the “Public Pretender” who plead me out like just another number. This is the ancient incident that Officer Gatlin thought made me dangerous? Can you even remember what you were doing twenty five years ago? I’m still being punished for this? Even after eight months in jail (first offender), $2,000 restitution, three years psychological therapy and three years of formal probation, twenty five years ago? No violence since then? In fact, you never finish paying your “debt” to society after an offense, it actually gets worse as time goes by no matter how good you are (Three Strikes Law makes an old assault a “Strike”). What incentive do you have to rehabilitate if that is the case? I guess the Prison Industry and law enforcement needs a steady supply of slave labor and snitches. How better to meet that demand than by making you a criminal for the rest of your life not matter how good your behavior. No wonder convict recidivism is so high, you might as well be wearing a lifelong “Scarlet A”. That system makes us all far less safe. With judgement like that, no wonder a San Pablo Officer recently allowed a Bayfair Market Store owner to bleed out while he did nothing but take pictures. Even I would do something to help an innocent man who had just been shot five times, especially if he was pleading for help. I’ve seen people rush to the aid of a stabbing victim by pulling off their own jackets to try to stop the bleeding, with their bare hands no less (I had nothing to do with the stabbing, by the way. I just happened to be walking home and saw it). I guess San Pablo PD is lacking in both good judgment nor compassion. Perhaps all those federal grants have bought their humanity. What a shame for us all. They’ve been shafting the San Pablo citizenry for a long time now, THEY SEEM TO THE ONES WHO ARE A DANGER TO OTHERS. Can anyone say “BART Police”? What is it with these tiny police agencies anyway? Are all of them grossly incompetant? And finally, here is the actual evaluation itself for which I was thrown into the loony bin for. It shows that I was exhibiting nothing but normal behavior. Not a threat to myself, certainly not a threat to anyone else and I definitely was not gravely disabled (unable to care for myself). In the Psychiatrists professional opinion, I exhibited none of the three behaviors required to involuntarily commit someone under the Lanterman Petris Act (LPS). This means one of only two things. 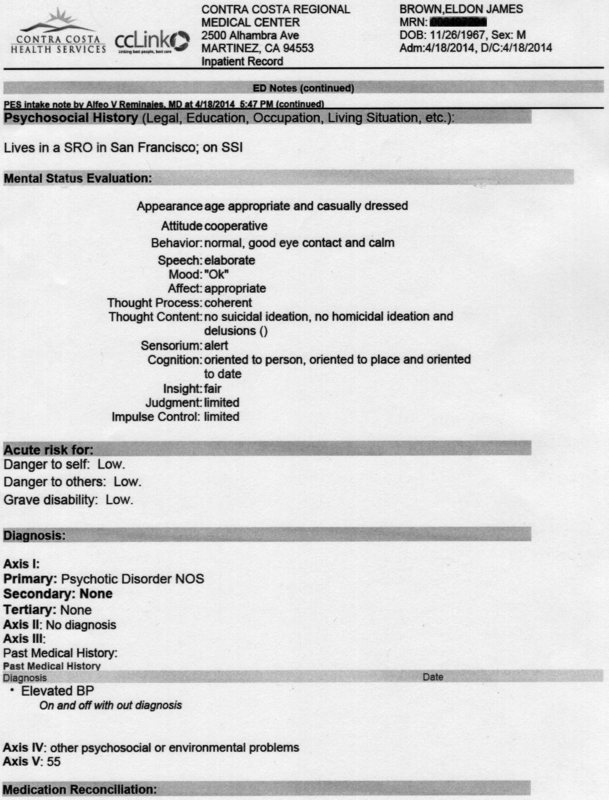 Either San Pablo Police Officer Justin Gatlin’s judgement was so poor that he cannot tell when someone is a danger or not or, he was complicit in the Gang stalking. 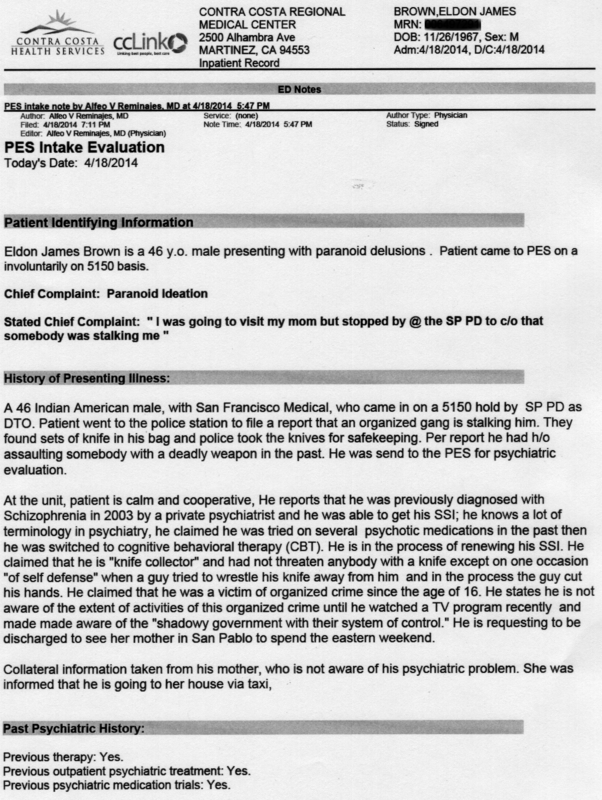 I went to the San Pablo Police Department to report being Gang Stalked by them, after all. If it can happen to me, it can happen to you too. It can happen to anyone you know, just because someone wants to put you away for good. We are all in danger with this LPS Act on the books, this is the very same thing they did in Germany about eighty-five years ago with the Ministry Of Health and and the SS… Seig Heil! In the History of Presenting Illness it states, “They found sets of knife in his bag…” The police did not “find” knives in my bag, I told them that I had knives in a toolbag strapped to my luggage cart, when asked if I had any weapons on me. My response was “No, I don’t have any weapons on my body but I do have knives in a bag on my cart.” As you can see by the numerous misspellings and grammatical errors in the Intake Evaluation Report, they got a few things wrong. I truthfully told the police that I had knives packed away, when asked about weapons. I came to them, after all. In addition, I do not receive “SSI”. 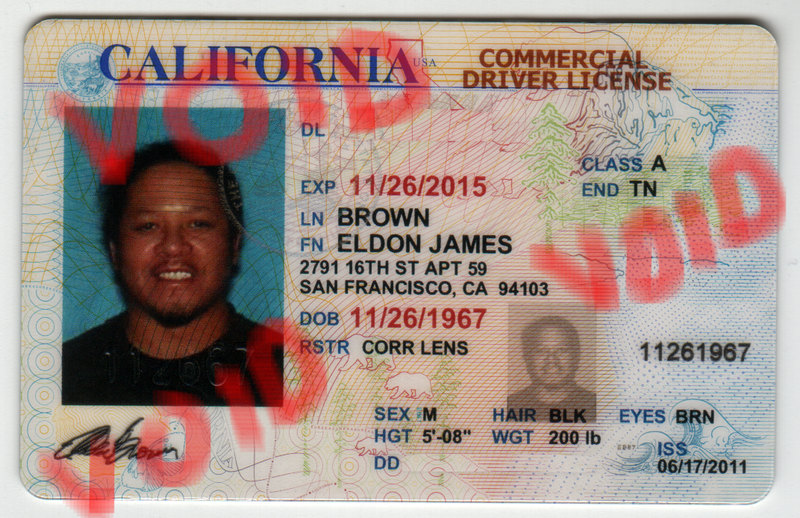 SSI is a State Of California disability insurance program administered by the Social Security Administration, I recieve no SSI payments, I recieve Social Security only. People who recieve California’s SSI payments are not required to have any work history, just a medical determination of being disabled and unable to work. To recieve Social Security alone such as I do, you have to have been employed and contributed an amount sufficient to receive over $860.00. I have worked for most of my adult life, even while homeless. I used to have ALL endorsements including Hazardous Materials, but when 911 happened the DOT took the HazMat from everyone. I never bothered to re-apply for something I had already had, for $120 more. As you can see, I’ve corrected my mistakes and rehabilitated myself despite being in a Gang Stalking death program since the age of at least 16. I was probably marked from birth. Anyway, for all my efforts at becoming a decent person, I get to have the police and our government torture me to death. America is near death people, even Donald Trump has said as much. We are being overrun by Devil worshiping Nazis too stupid not to follow a man already condemned to death (Satan). Soon the Sixth Seal will be opened and that Man of Sin will be here on Earth. You Gang Stalkers will get what’s coming to you soon enough if you don’t come to your senses. Jesus has his hand extended, you better take it while you can. Tomorrow is promised to no one. You have absolutely no idea the horrors awaiting you if you don’t, forever and ever more. Humans are the weakest things in Hell and have the worst condition there because we look like God (his image). Figure it out, future plaything of Demons.